Last week, I spent part of a couple of days watching an XR-5 liner being installed in an existing, drained pond in Knoxville, Tennessee. Aside from beautiful weather in a beautiful part of the county, it was very interesting to note certain details that you don’t always think about that make or break a successful installation. Not all geomembranes are strong enough or even meant to be able to compensate for errors below. Like paint is only as good as the surface it covers, you need to have a good subgrade to support the membrane for many years. This one was firm. Oh, wait, we discussed this one. But, there is even more; not only does your subgrade need to be stable and firm, but it also needs to be clean and prepped. 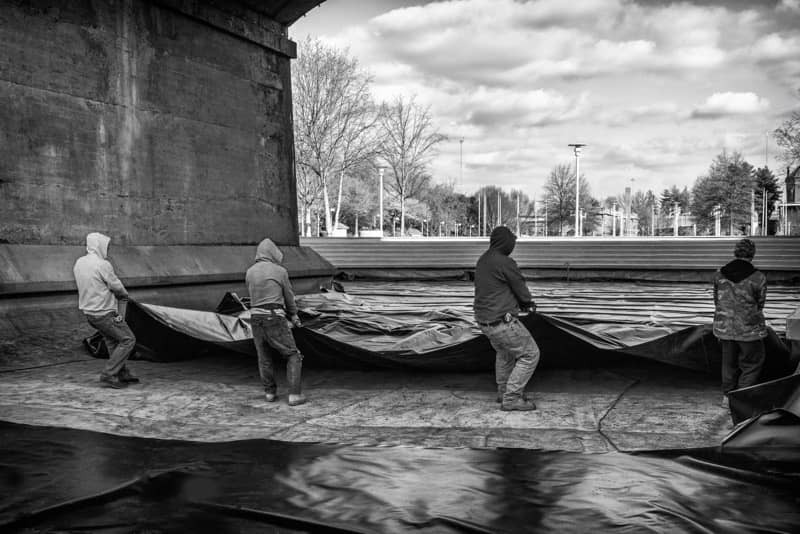 In this installation, which will function as an impoundment liner, a dirty subgrade would generate decomposition gases, resulting in upward pressure on the Geomembrane. Potentially, this could result in a bubble, or whale. The installers cleaned all debris, leaves etc. off the subgrade to prep accordingly. A liner with a specific gravity >1 like this one also helps keep it firm in place. Rectangles and squares are easier shapes to fit than any other custom shapes. But, this impoundment was a serpentine shape. A prefabricated Geomembrane made the installation look easier than doing total construction in the field. Prefab Geomembranes also reduce construction costs, giving a better return on investment. Plus it makes installation and longevity more reliable because there are fewer field seams. You have to do it. If the installers had tried this with a rigid material, it would be like installing plywood. This material really moved around well. Because it’s easy to move around, it’s easy to fit and gives a more reliable installation. Further, there is less chance of stress on the membrane because it does not properly fit the installation. They have the potential to be the weakest link. If you can minimize them, everything goes better. The Knoxville pond had a clean, hard subgrade so seaming was easier; plus, there was less of it due to the prefabrication. The perimeter battening started after I left the site last week. I look forward to seeing and sharing the final installation.